This remarkable chocolate assortment is a sure way to any Ghirardelli chocolate lover's heart. It includes three different varieties of Ghirardelli squares; dark chocolate with caramel sea salt, milk chocolate with caramel and milk chocolate. Also includes Red Thread chocolate chip cookies, chocolate drops, dark chocolate with sea salt caramel bar and double chocolate cocoa. 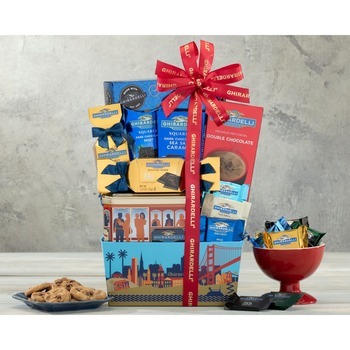 In addition, this great chocolate gift comes nestled inside a basket displaying San Francisco's Golden Gate Bridge, home of world renowned Ghirardelli chocolate company. * Thank you for excellent service, you make things easier for foreign buyers. Merry Christmas to all of you. * It is an easy site to order from and my orders have always been of a high standard and delivered on time.